This is the second in my new series on The Yale Forum on Climate Change & The Media, and premiered last week on that site. 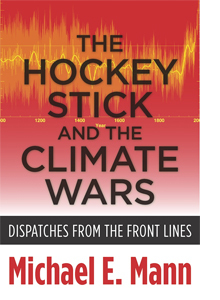 I’m very proud to have had the chance to interview Michael Mann, and tell a small part of the story that he relates so well in his new book, The Hockey Stick and the Climate Wars. The book is an essential one that historians will be consulting to understand this singular moment in history, when humanity dithered on the edge of catastrophe. Unless you’ve been intimately involved at every stage of this drama for the last 15 years, you’re probably confused about the course of the game, and the players. Mann’s painstakingly footnoted and referenced text gives a narrative and timeline that help make sense of things. There’s enough here to spark a dozen Master’s theses, in journalism, History, Political science, as well as Paleo-climate. Fortunately, as the video relates, Barton’s colleague, Rep. Sherwood Boehlert did, in fact, consult the National Academy, as Lincoln intended when he founded that august body – and we have a legitimate scientific assessment of Mann’s work that affirms the original findings. There’s still more of the interview that needs to be heard. In addition, I tracked down the C-span video of Barton’s hearing, where Mann makes clear and concise defense of his work. Parts of it are excerpted in the video above, but I find that it’s an important historical piece of the puzzle, and virtually unseen compared to the avalanche of bonehead denialist anti-Mann nonsense that has poisoned the internet dialogue. I’ll be making that more accessible soon. If you’ve read the book, I hope you’ll go to the book’s Amazon page, and if you’re moved to give a good review, help even the odds against the onslaught of Anthony Watts and his horde of internet Orcs, who are displaying typical swarming behavior. If you’re intimately familiar with the players and the saga, it doesn’t say all that much new, agreed. But putting the truth in one place is of benefit; that’s what histories are for.